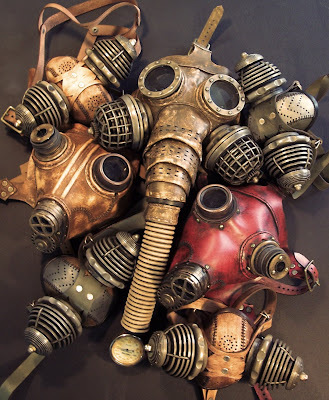 The seven gas masks and respirators that I've been making for the indy film After The Fall are now all finished, as pictured below. 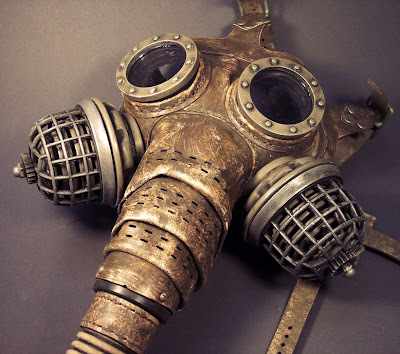 I changed the canisters on Packrat's mask to reflect his workplace, the sewer. Each canister consists of a bronze filter within a protective cage. As always Tom your work is awe inspiring. Love to look at it. Those look great! Top job! Just popping by with wishes for a wonderful holiday season - cheers! Incredible... I love seeing them all together like that. Keep us posted about the film's progress!